Lyle: Here's another finger picking pattern to learn. This pattern is for the open G chord. 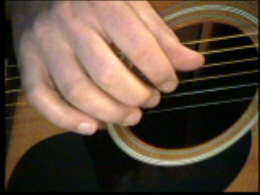 You'll pluck the bass note (6th string) with your thumb, at the same time plucking the 1st string with your 3rd finger. Your index finger will pluck the 3rd string, and your middle finger will pluck the 2nd string. This is a tricky pattern so go slow to make sure you're doing it right. Soon, your right hand will get used to it. Lyle: There, 4 chords, more than enough to make a song! Next you're going to make a short chord progression from these chords to practice this pattern with. On all these picking patterns, remember to keep your 3rd finger on the 1st string, 2nd finger on the 2nd string, 1st finger on the 3rd string and use your thumb for the bass notes. Lyle: After you have became familiar with these chords and the right hand pattern, try putting them all together like this. Bry: What does "add9" mean? Lyle: This means add the 9th degree of the scale to the triad. The D note is the 2/9 in the C major scale so we add the D note to the C chord. Lyle: Let's add more chords. The "relative" minor to C major is A minor. Bry: What do "sus4" and "sus2" mean? Lyle: Bry, a basic chord is made up from what's called a "triad". The major triad is the root, 3rd and 5th combined to make the major chord, the minor triad is root, b3, 5th of a major scale to make a minor triad or minor chord. The sus2 (suspended second) chord is root, 2, and 5th of a maj scale, the sus4 (suspended fourth) is root, 4, and 5. Lyle: So a C maj chord is made up of the triad, root, 3rd and 5th of the C major scale, C, E and G. The Csus2 is C, D and G, Csus4 is C F G.
Lyle: I practice finger picking on both acoustic and electric guitars.